Literally translated as Heli Commando in Hell, this is a mouse-based military shooting game by the developer who previously released Asteraiser. 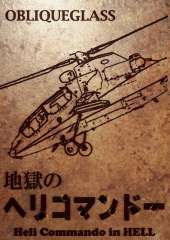 Taking place in 198X, during the Cold War between east and west, helicopter had become a sophisticated vehicle used in the battlefield. Set in Bell Bardo, a small country located on Western Ocean, a military coup broke out and multinational fleet was dispatched to resolve the conflict. The player is tasked with numerous missions by using newly developed helicopter XOH-1 "Ninja Commando" capable of great attack and mobility. The helicoper has two modes of fire; machine gun and ground weapons such as rockets, bombs and long range guns. When a mission is completed, the result is displayed in the flight history. The medals will be awarded according to progress and success evaluation. The player can upgrade helicopter with obtained medals.